Someone over at the Center For Disease Control (CDC) is a genius. During the whole senile old coot using an abacus, three kidney beans and a goose feather to prophecize doom, someone decided to make emergency preparedness fun. About time! Now, if someone could revolutionize how a fire drill is conducted... Talk about dull. For one reason or the other (probably because I spent the entire week dogging the Alzheimer induced soothsaying of a madman) I did not take the time to read this online pamphlet. 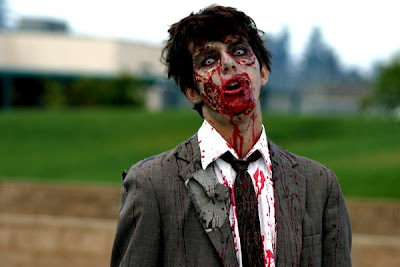 Now, that I have, I feel more confident that I would survive a catastrophe occurring in nature such as a hurricane, tornado, earthquake or flood than an attack from the living dead. I am speaking of the need for potable water, canned foods, batteries and the like. However, when dealing with an onslaught of the walking dead, the firearm is king. Seriously, this list is devoid of anything that I can use to protect myself and my loved ones. You could have put something on there, a baseball bat, chain saw, golf club... Even a rock. I suppose they were hoping that the zombies will fear a stern look or a rattle of the fist causing them to forgo feasting on the food within our melons. As I said before, this guide was not only entertaining but downright cute. However, it was far from practical. You know what will happen to those following this manual to the letter in a zombie apocalypse? They will join their zombie neighbor Jim who previously stole their WiFi before it and their sweet juicy brains after it. This was because they followed the motions for surviving a natural disaster not an unnatural disaster one. Shame on you, CDC. You have reduced the emergency preparedness of this fine nation's citizenry for a zombie attack with your list. It is like you pulled the fire alarm at a school. Also, I found your assertion, "If zombies did start roaming the streets, CDC would conduct an investigation much like any other disease outbreak" to be laughable. 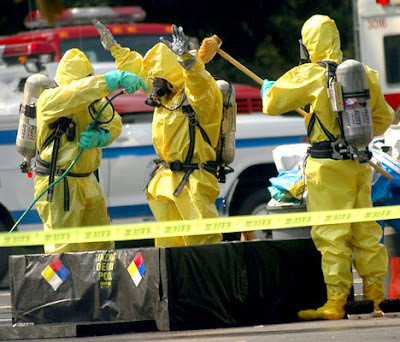 We have all seen the Walking Dead and how woefully unprepared the Center For Disease Control is for dealing with such an outbreak. 2. Fire Extinguisher...No, not because of the fires. Because if the spray doesn't scare them away, I can always hit them with it. 3. A good jabbing stick. Self-explanatory. 4. Water. I'm going to work up a thirst fighting zombies.